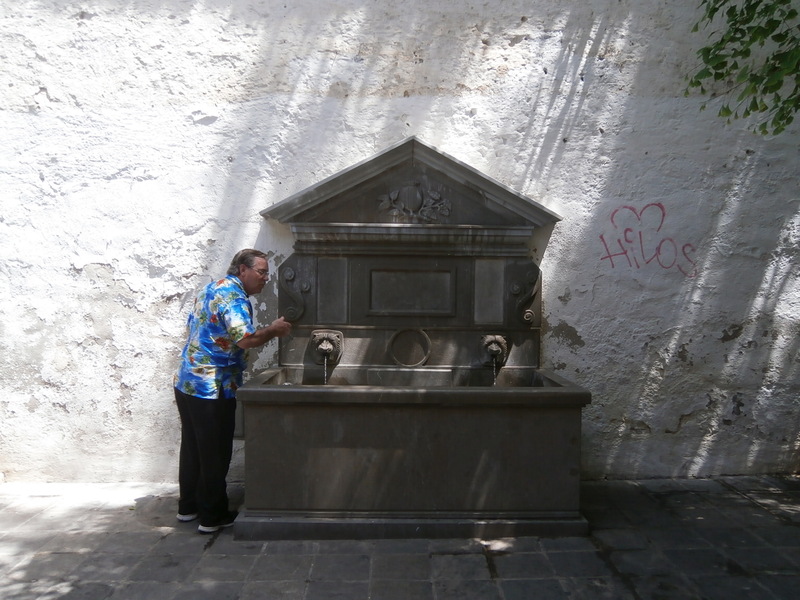 During our recent exploration of the University City of Granada I was reminded of a truly special gift given to travelers; that of free entertainment! I knew this of course but periodically I have to be reminded of avenues to look for fun things to do that most travelers don’t have the time to check out. In fact this might surprise you as well. As we strolled down the streets of Granada recently we heard chamber music wafting towards us. Knowing that the school of music was near we figured that we had found a group of students in rehearsal or practice mode. In reality we happened upon a free chamber concert. We entered the venue, sat, and spent an enjoyable hour listening, all for free. 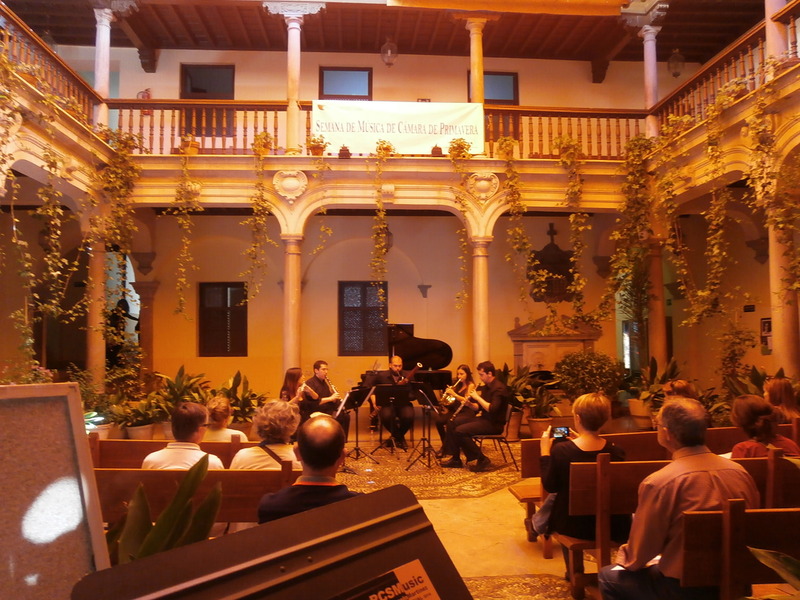 Called the Musica de Camara for the Semana 2014 at the Real Conservatoro Superior de Musica de Granada and nestled in an open air court were the flutist, oboist, bassoonist, clarinetist and a French horn player. Sometimes I need to be reminded that colleges and universities offer entertainment to the masses as a showcase for their students. I have attended performances in the past at several schools. I have seen the musical Cabaret performed at UCLA’s school of drama; endured the play Reservoir Dogs with all its grittiness; and sat in on several student written productions offered during the semesters. I have attended these plays in cities such as Buffalo, NY; Los Angeles, CA; Olympia, WA; and now in Granada, Spain. Not all these offerings are free to attend but the costs to see them are set at student pricing and therefore cost way less then attending a full stage production on Broadway. If you plan to spend any length of time touring or vacationing in a city with a college or a university check out their websites or stroll to the campus and check out the bulletin boards and look for concerts, plays, or even sporting events that you might like to attend. You never know when the travel memory you will remember most might be the one you happened upon for free. I for one am glad that students with so much talent attend college and that they like to perform. I’m an appreciative audience, someone who has come from a long distance to see them perform, and if they are good I will also be the one applauding the loudest. For some strange and inexplicable reason people go to other countries to buy property. They feel I guess that they are making a good investment in having a home in a spot where they might vacation often and it is cheaper to have a place to go to that they own rather than having to pay for a hotel all the time. For some however this luxury scheme is just that and they are the ones losing out. In the last week in the local expat newspaper was yet another story of two folks from Britain who had bought and furnished a vacation home here in Spain. They enjoyed years of traveling between the two countries living and working in the UK but vacationing here. Somewhere along the line however they must have pissed off the wrong person. They arrived a month ago to spend a little time at their vacation home only to find a For Sale sign out front; all of their furniture, clothing and family heirlooms removed and gone and every fixture removed from the walls. In shock they contacted the bank on the For Sale sign and were told they were only following repossession orders that they received from the courts. This couple never received any notification from anyone that there was an issue with their home and the bank which was on the For Sale sign was not the bank that they had done work with in order to buy their home in the first place. According to all the authorities involved oops, our mistake, wrong house. It is of course too late to return any of the furniture to them because no one knows where it went; no one is taking responsibility for who gave the order or who brought the court order either. The expat loses completely here, end of issue. The banks were following the courts orders so they have no liability. No one is saying where the court received the order from and no one owes the expats a dime. Another case came up recently where two Italian citizens were posed with the threat of jail time because they built a home on a parcel of land where they did not legally own the property; even though they had gone through an attorney and thought that everything was legit. They put down their money; built the home; mortgaged their property in Italy to do so and then found out that none of it was legal and they might not only lose the home in Italy they used for collateral but also spend time in jail. Again, the expat loses here. In Panama we heard of a woman from the US who had bought a home in the country using what she thought was a good attorney whom had been referred to her. She bought the home, thought she had clear title, furnished it and returned to the US because she was only going to vacation in Panama. When she returned to Panama two years later she found her attorney living in the home and she was told since she had abandoned the property it was no longer hers. Last we heard she was still fighting it but again she is the expat and the Panamanian attorney knows the laws in his land way better than any expat and whom does she think the courts will side with? Not every expat gets cheated out of their money or loses their home. The problem is that just as many do have legal issues in a foreign country and so far none of the resolutions we have seen have been in the favor of the expat. Did you know that in many countries the only legal document is the one written in the native language? Even if you have a document written in English it does not take precedence over a document written in Spanish for example. Make sure therefore that any and all legal documents you sign are clearly understood by you in either language. This way you won’t be sorry you signed on the dotted line. Mike and I agreed early on that we were no longer buying property anywhere. There really isn’t time for a good return on our investment and the equity we might build would be too many years away. We certainly have never found it to be the case where an expat made loads and loads of money off a property investment in a foreign country. We would rather spend our money traveling and going to new places instead of worrying about whether some foreign bank or entity had repossessed our property. We also like the freedom to not have to return to the same place over and over again. This way we have nothing we leave behind and we take our memories with us, which is something we can guarantee no one will take away from us. This is not a unique phenomenon that only pertains to people outside of the United States. There are multiple reasons why locals do not travel. Many locals do not travel outside their own cities because they simply cannot afford to do so. Their income is enough to cover living expenses and travel is a luxury expense. This is the case in every country we have lived in, including the United States; some people just do not make enough money to afford to travel. This is why some people whom we meet think that Mike and I are wealthy because we have been too so many places and done so much. What they do not know is that we save a lot of money by living very inexpensively and by not flying into and out of the US wasting lots of cash, we travel as a local would travel instead so we feel that we are traveling smarter. We also concentrate on traveling to new places. This is a mind set choice. Not everyone has the mind set that if they have a spare moment or two they should use it to travel or visit someplace, be it local or long distance. I was born and raised in Buffalo, NY and I can tick off on one hand the number of times I’ve seen Niagara Falls. It is one of the natural wonders of the world and it was right in my backyard and yet I saw it only a handful of times. Going to see the Falls was just not a high priority; it was something we did when people came to visit us from another state or another country. In this instance perhaps familiarity does breed complacency. In my mind I always knew the Falls were there and they would be there whenever I wanted to visit so I planned vacations to far off lands instead. Another reason many locals do not explore the treasures right in their own backyards is that they do not know they exist. We had a tour guide in Sarajevo, Bosnia-Herzegovina tells us he bumps into this problem all the time with his friends. He will show them amazing pictures of beautiful places and they all ooh and aah and ask him where these places are. He tells them less than an hour’s drive from their doorstep and they do not believe him. He assures them these treasures are there for their enjoyment. Sadly they still do not make the time to go and see them. Perhaps travel is only travel to some people if it involves long distances or even in using a passport. Tourism is big money and tourism boards spend a great deal of time cultivating buzz and getting tourists from other countries to come to their country to explore and spend money. What they ignore or even forget about is that their own people, other locals, might just be interested in what they have to offer as well. We found this to be the case in Sibenik. Croatia. Our landlady told us that we were incredibly lucky to have made the contacts we made and to get to see as much of her country as we had. She said she was born in Sibenik and hadn’t been too or even heard about some of the places we had been, but given the chance she would go and see all of these places in a heartbeat. So yes, another issue is having the opportunity to see these things. People fail to ask the local tourism boards what it is they are showing tourists who are coming to their city because they think they know everything there is to know about their city; they were born there after all so they must therefore know everything about it. Several years ago I returned to Buffalo and planned a whirlwind set of days for excursions of places to visit. My nephews thought they had seen everything in the city or knew about all the places and laughed when I said I was going to set up a tour of the city. I pulled out all the stops. We rode the Carousel in Tonawanda (one of the last all wooden still working carousel’s in the US); we went to the Eden Kazoo factory where they handcraft Kazoo’s; we went to the Q-R-S museum where they made the music rolls for player piano’s and I finally rode on the Maid of the Mist which is as close to Niagara Falls as I wish to get! All of these things were less than a couple of hours drive from their home but they had never been to any of them. They were in awe that these things were available to them and they did have a good time. Many of us fall into the time trap that on weekends we need to spend our time in doing laundry or mowing the lawn or in doing other household chores. In reality we should be taking the time to get out and explore those things that are right at our own doorstep. It is so easy to get into the mind set that we’ll get to see all of these places one day. One lesson Mike and I have learned is that if we don’t concentrate on seeing these things now we might never find the time to have this experience later. The old saying, ‘don’t put off until tomorrow what you can do today’ seems appropriate here. Mike and I are determined that when we get back to the US we don’t fall into this trap again; the ignore everything right in our backyard trap. We hope to explore everything we can in our city, county, state and country. Maybe we’ll make a grid and walk and explore this grid on a weekly basis until we have seen or experienced everything around us. This way, when someone asks us what there is to see in our neighborhood we’ll just smile and ask them how long they have to explore. Have You Been to Pomegranate City? No story of the city of Granada can take place without mention of Christopher Columbus and Queen Isabella. It was here in Granada that Columbus received his commission from the Queen to sail for the West Indies. He made it to the shores of America instead. Columbus finding the America’s helped to make Spain a world power. 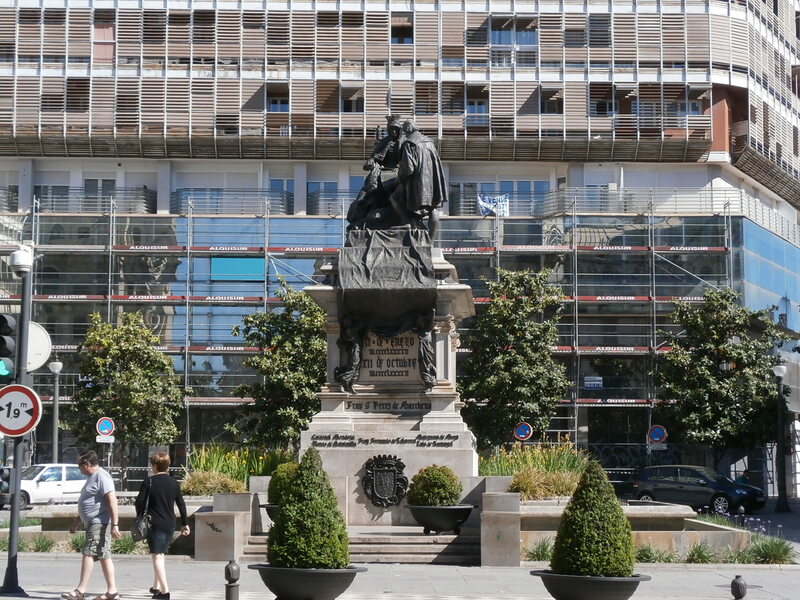 The statue depicts Columbus receiving his royal orders. 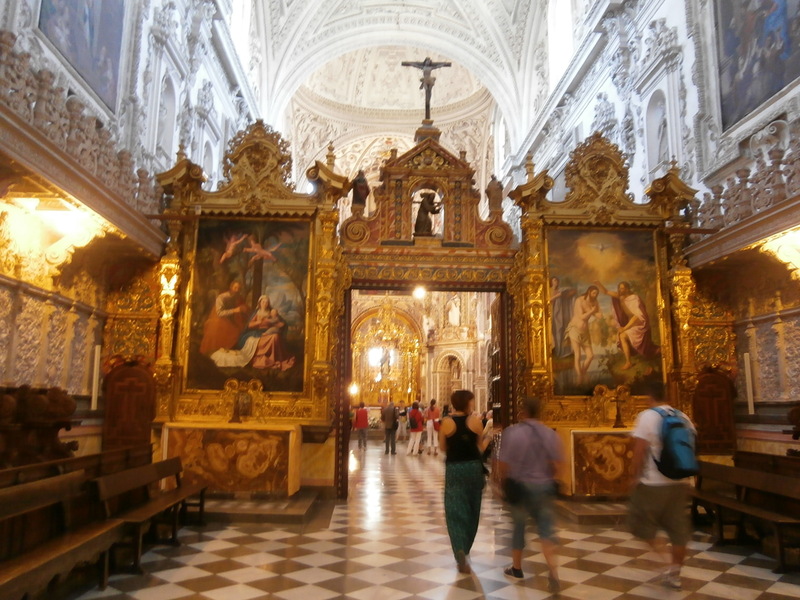 This is the entrance to the Royal Chapel. It is the final resting place of the Catholic Monarch’s, Queen Isabella and King Ferdinand of Aragon. The chapel was built between 1506 and 1521. Photos were not allowed of the inside rooms or museum treasures. Besides the vault area where the monarch’s lie in repose there are on display sculptures, tapestries, paintings and Isabella’s scepter, crown, chest, mirror and Ferdinand’s sword. In 1511 by order of King Fernando V this hospital was commissioned to be built. It was constructed to give the common man a place for proper medical care and is still in use today. It is called the Hospital Real. One of the positive aspects of being in a city with a younger population is that the food fare is often healthier. This vegetable sandwich was made with beets, carrots, corn, lettuce and tomatoes. When the cost of sugar became too expensive in Granada many years ago they turned to beet production. Beets are therefore very important to the economy of Granada and found in many dishes. 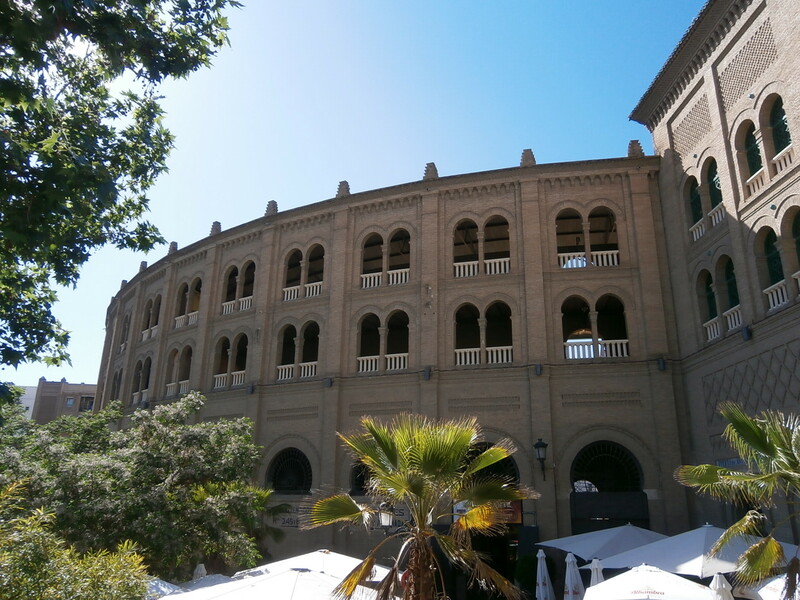 Almost every major city in Spain has a bullring. This is one of the largest with a seating capacity over 14,000. It is still in use today as Granada hosts several bull fights a year. It opened in 1928. Granada is a mixture of architectural styles. 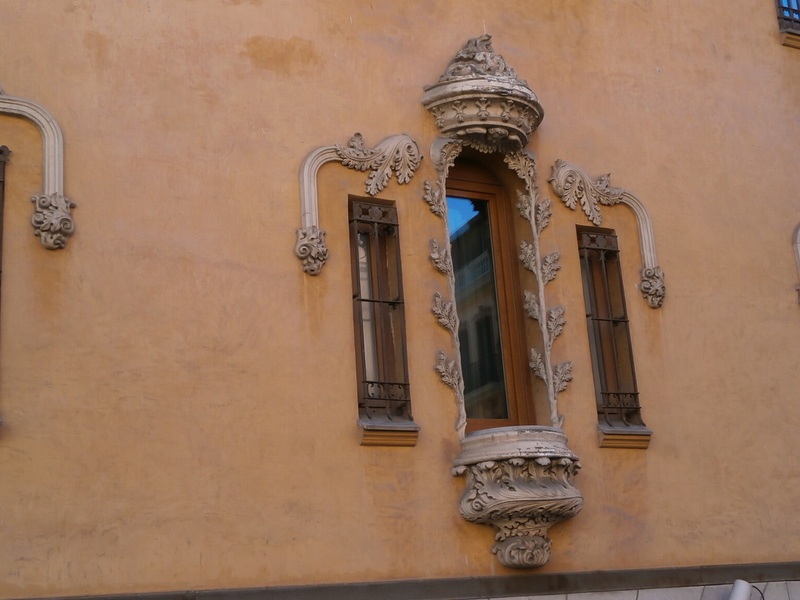 It seems as if no door or window is left unadorned, be it with wrought iron balconies, flower boxes or decorative carvings. 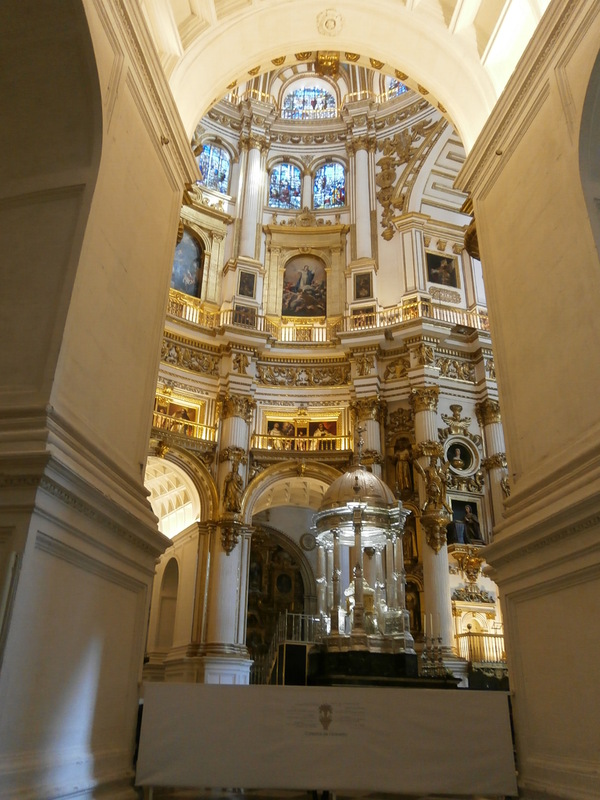 The Cathedral of Granada. Construction began in 1518 and took 181 years to be completed. 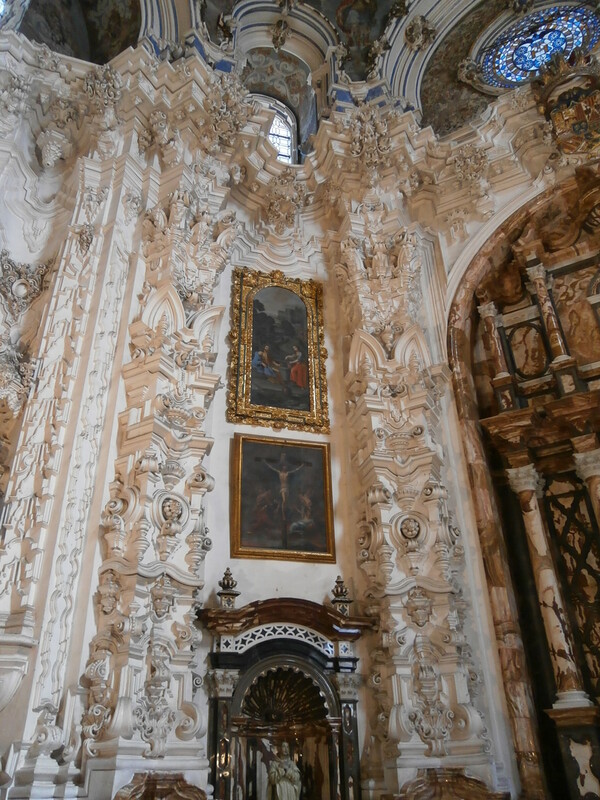 A closer view of the main altar of the Cathedral of Granada. To give you some scale as to how high these columns were Mike is shown standing at the base of one of the columns. 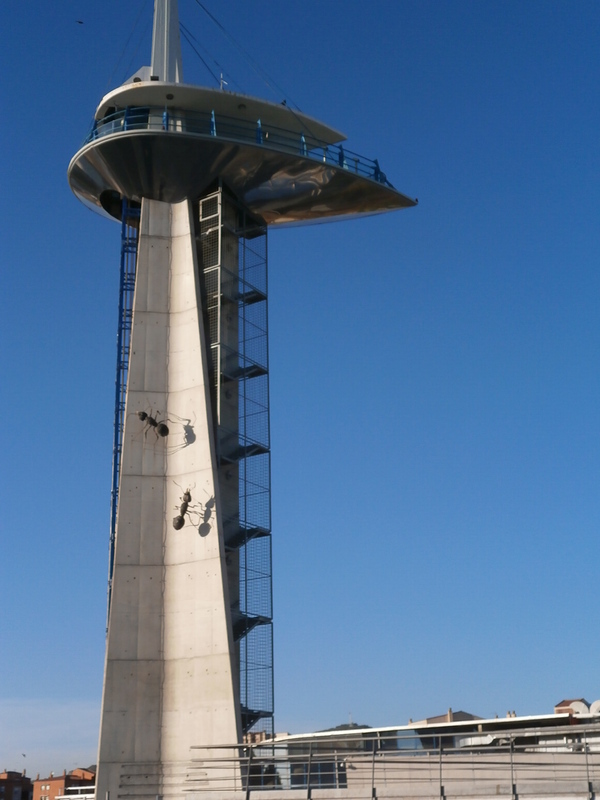 This is the tower in front of the Granada Science Museum. The Science Park is a 70,000 square meter interactive museum which invites participation in order to understand environmental phenomena such as inertia, gravity and Archimedes’ principle. I could not find any data as to when it opened. These are piononos, a dessert named after Pope Pius IX. 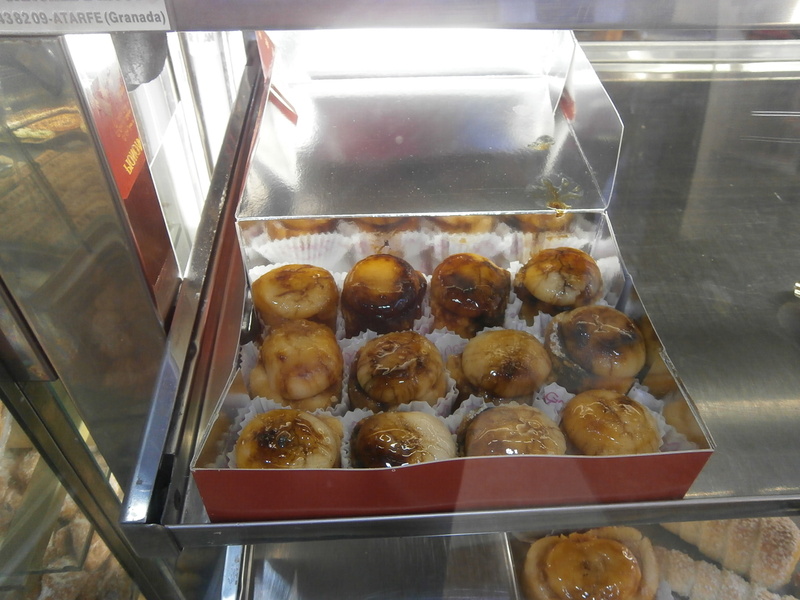 They are made with sweet roll, syrups and cream. This is a dessert from this region of Spain. 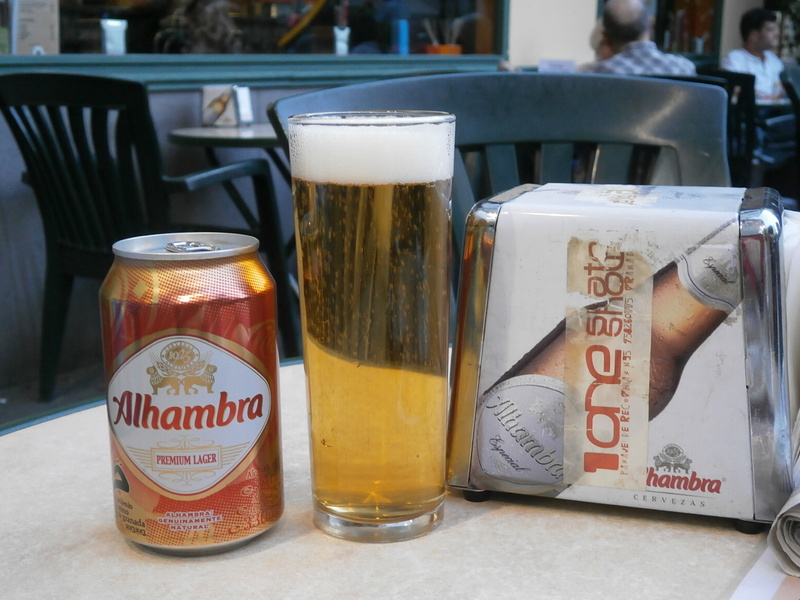 Alhambra is not only the name of the local tourist attraction but also one of the local beers. They have been making this beer since 1925. It is made right in the city and the water comes from the Sierra Nevada mountain range. While we never found any pomegranates to eat in the markets we did find the symbol in the oddest places scattered throughout the city. 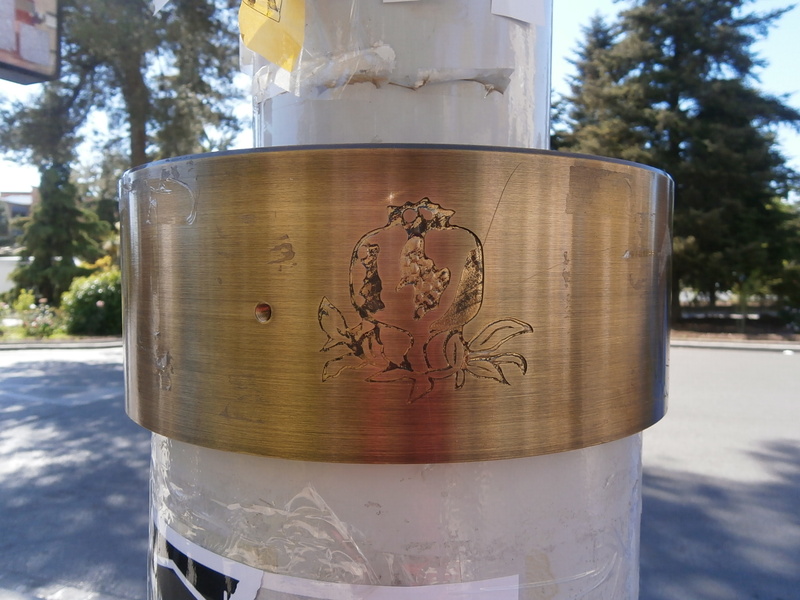 Here is was on the light poles. The name Granada actually means pomegranate. 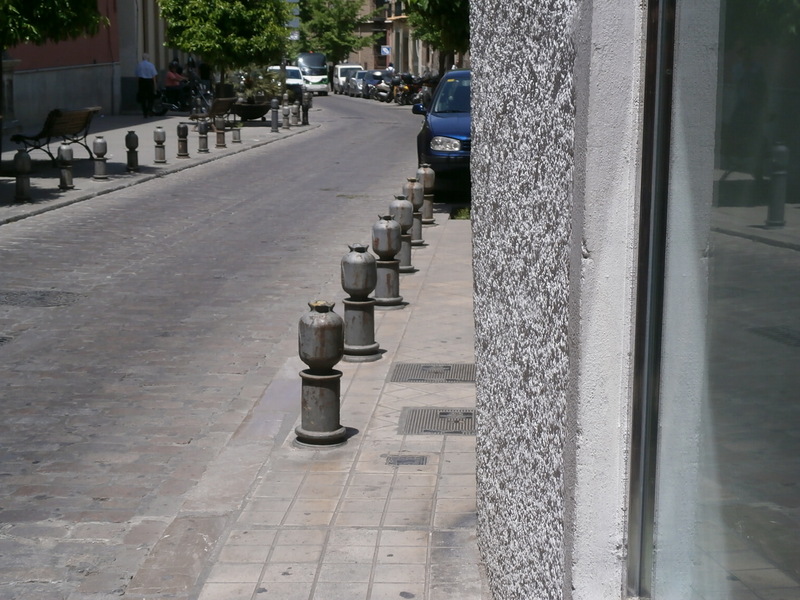 Here the pomegranate symbol was used as a barrier between the road and the sidewalk. 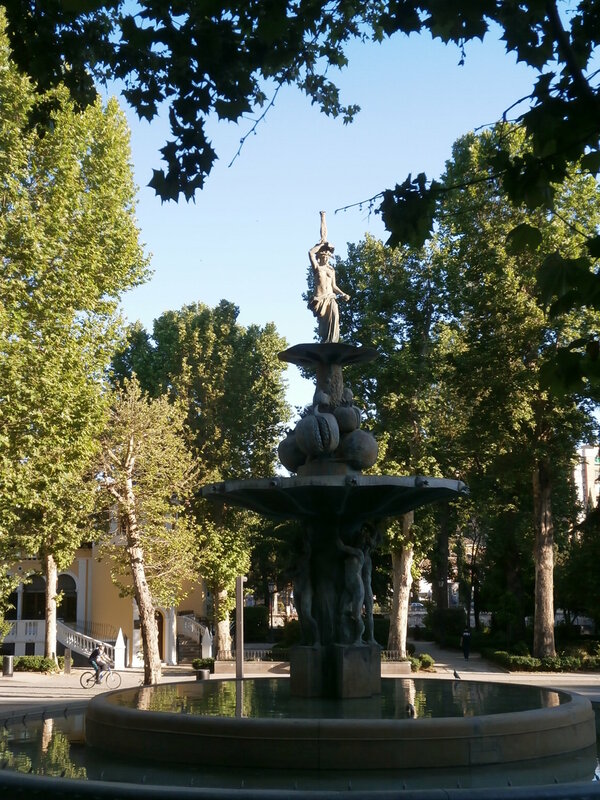 And this statue was found in a local park depicting a water nymph on top of a pile of pomegranates. Water fountains such as this were found scattered throughout the city. The water coming forth was fresh and clear. However I was worried about the water in the well portion and my fears were confirmed. Just after Mike drank some of the water coming from the tap and then used some of the water from the well to rinse his face a man came up to the well; removed the leash from his dogs collar and the dog jumped completely into the well. Mike returned to the hotel and promptly washed his hands and face. A view of the Sierra Nevada Mountains. This is considered one of the best ski resorts in all of Europe. There was still snow on the mountains even in early May. 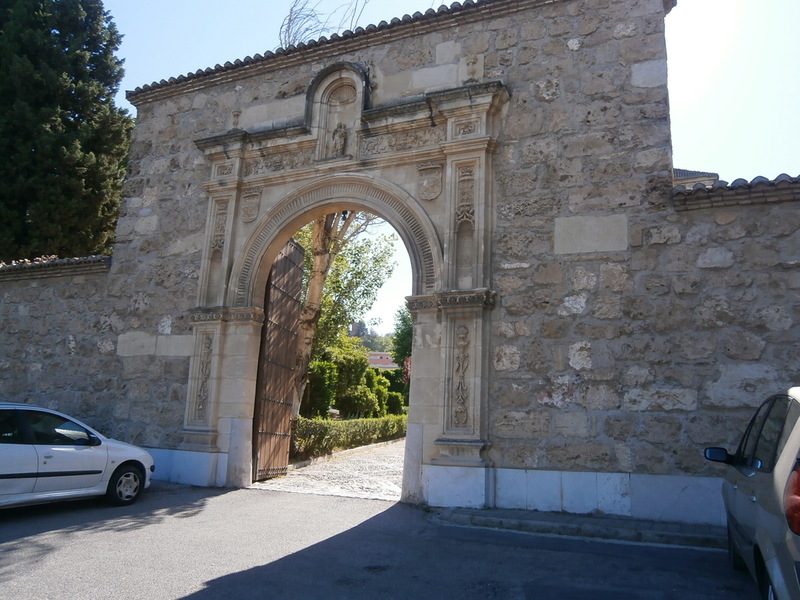 The history of Granada goes back 2500 years. It’s economy is derived from tourism, fishing, manufacturing, and higher education and its population base is mostly young. It enjoys mostly a warm and dry climate all year. This is a very easy city to navigate and the hop-on, hop-off bus ride takes just 90 minutes to drive you past the landmarks and the local attractions. 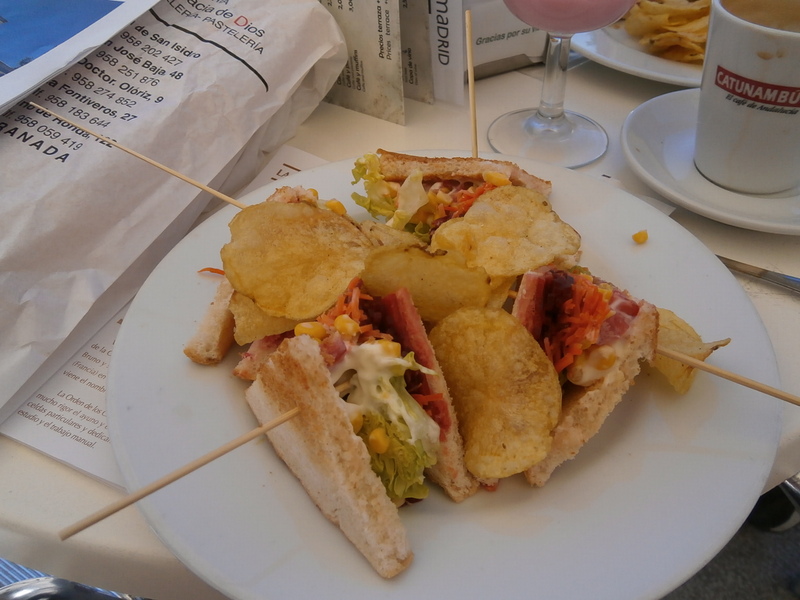 There are many cafes and restaurants to eat in and the tapas bars are plentiful. It is said that Granada has more tapas bars than any other city in Spain per capita. Ah, youth. We have been living in the senior heavy complex of Torrevieja for so long we forgot what it was like to live in a city with a young population. The overall younger vibe to the city, the energy pulsing through the streets, the people walking faster to get places, the restaurants offering healthier food fare and a place where everyone picks up after their canine friends. What a refreshing couple of days we had in Granada. Why, oh why didn’t we come sooner…? Granada has a current population of over 230,000. 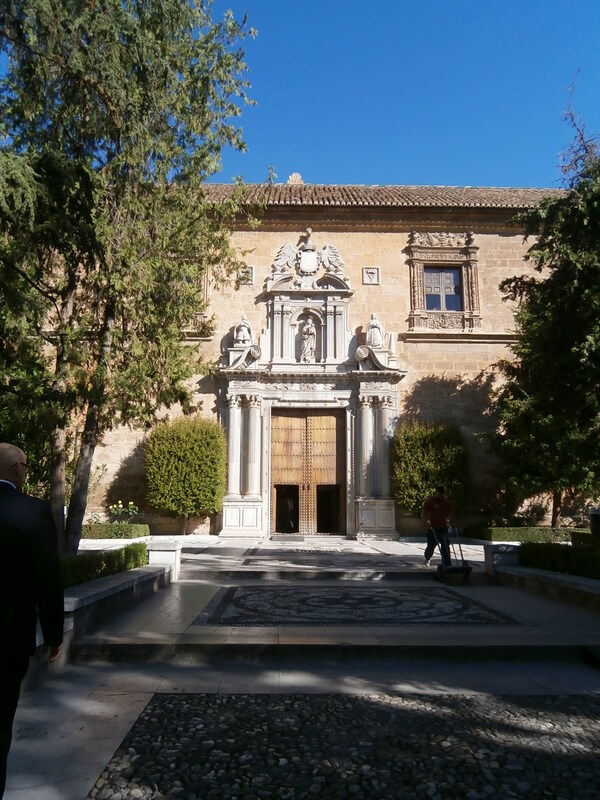 It is also home to the University of Granada which has a student population of 80,000 making it the 4th largest university in Spain. University buildings were scattered around the city which means that university life is key to the livelihood of the area. Granada is more than The Alhambra, a palace and fortress complex world renowned for its Islamic architecture. Mike dearly wanted tickets to see it and thinking that it wasn’t yet tourist season he waited to order tickets. That turned out to be a mistake since the tickets are limited for entry and you need to purchase them as far in advance as possible to your arrival date. You must also stick to the rigid schedule set forth on your ticket for entry since if you miss your appointment time there is still no guarantee they will admit you. 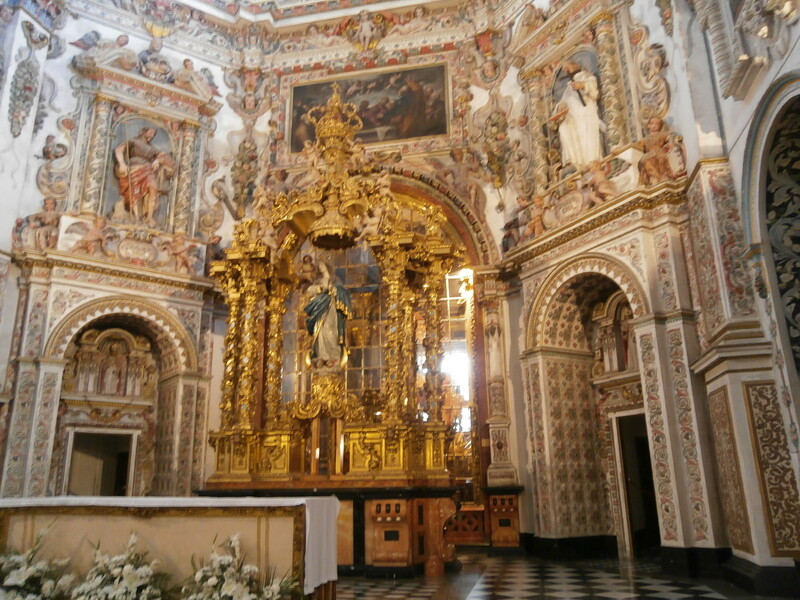 While this might have seemed like a downer to most travelers in reality it meant we had time to explore other sites around Granada and the first of these was the Monastery of Cartuja. This contemplative order of monks was started by St. Bruno de Hartenfaust in 1084. From the street the monastery building looks like a seemingly plain and unwelcoming place. Ultimately it reminded me of the walk one takes from the entrance of the Vatican museums to the Sistine Chapel. We just didn’t know it at the time. 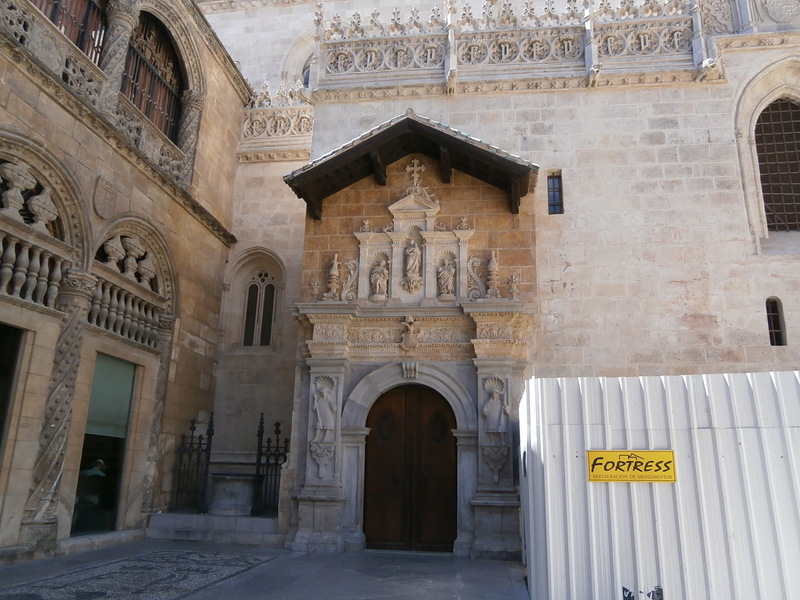 The entrance gate to the Monastery of Cartuja as seen from the street. It really didn’t look inviting. We were told by many locals however that they find the Monastery to be a better treasure than the Alhambra so this boded well. 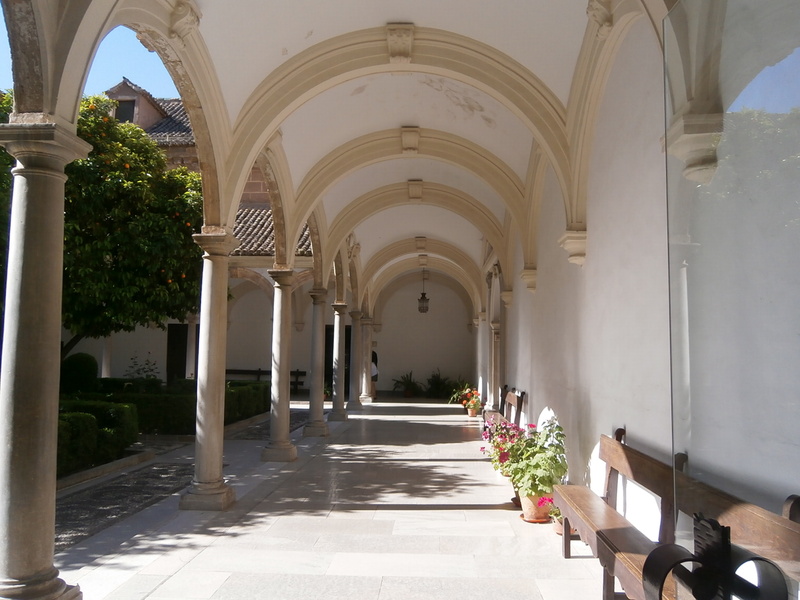 The center courtyard of the Monastery was the main portal to rooms filled with works of art and a very slim glimpse into monastic life. This room was where the monks from the Carthusian order would eat their Sunday meal. They only ate together on Sundays and Holidays. Other times they ate in their rooms, alone. Officially known as the Profundis room this is where the painting of Saints Peter and Paul painted by Sanchez Cotan hangs. 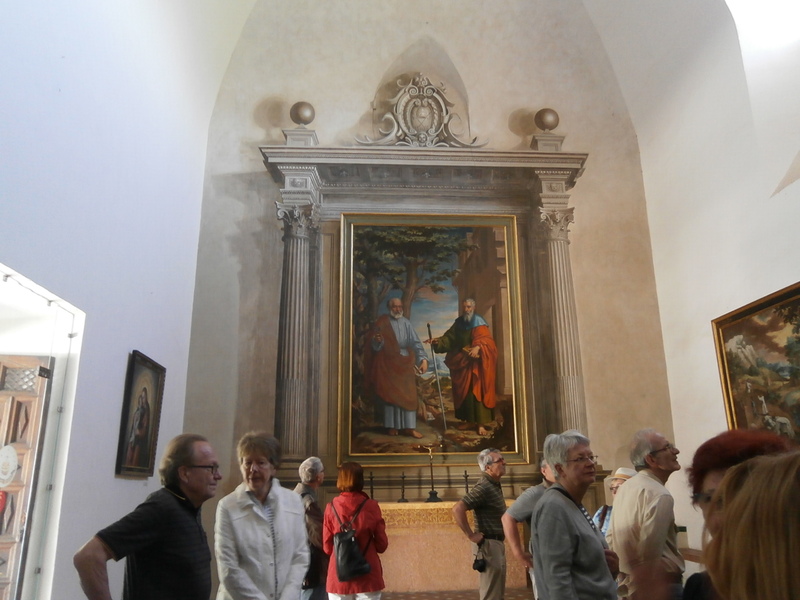 There where several examples of what you see is not what is really there in this monastery such as the marble looking frame surrounding the painting; it was actually painted on the wall to look 3-D.
We then entered the first of three chapels. 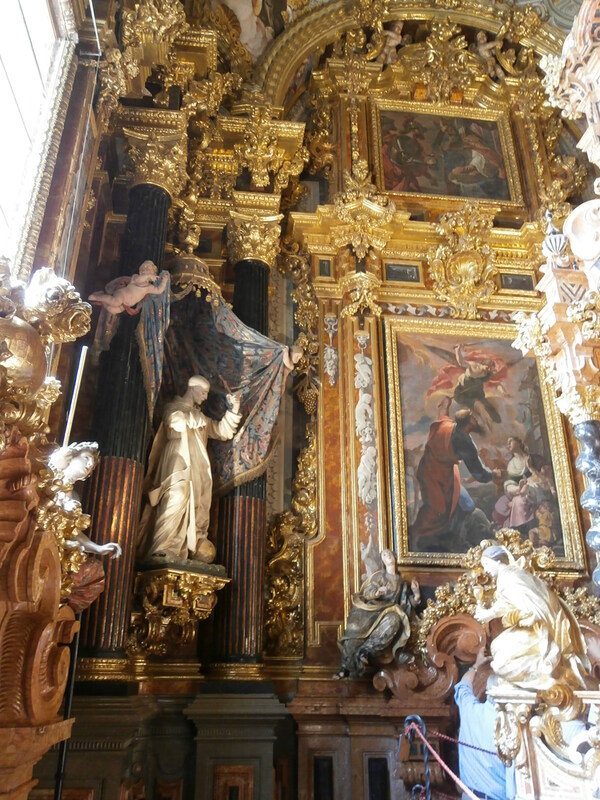 This was the main altar. This is the wall above the main entrance to the chapel known as the chancel; it was through this door that locals would enter the chapel. The door we entered through was accessed via the monastery itself and was used as an entry by the monks. Every square inch of the chapel walls was covered in paintings, tapestries or sculptures. 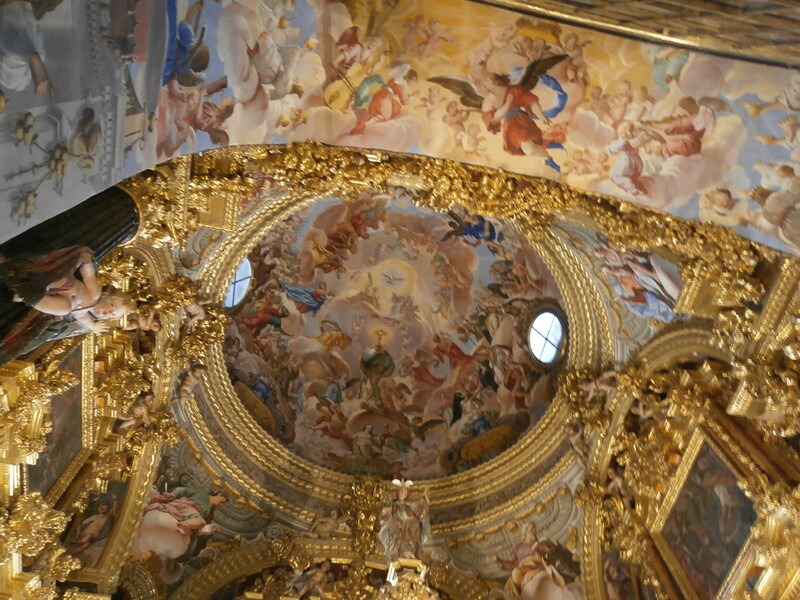 If I didn’t know better I’d say it was fashioned after the Sistine Chapel. 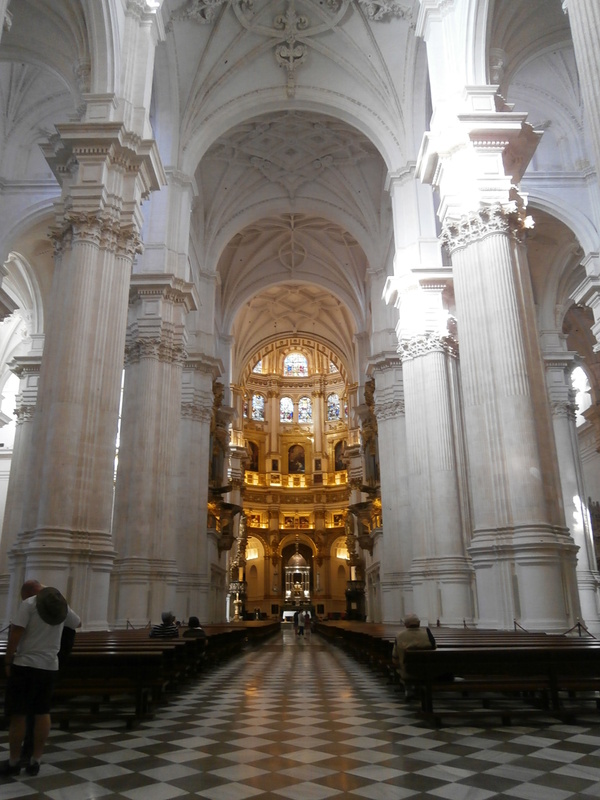 First one entry; then a choir area which led to the main altar. The church was built around a single nave and construction began in the 16th Century and completed in 1662. 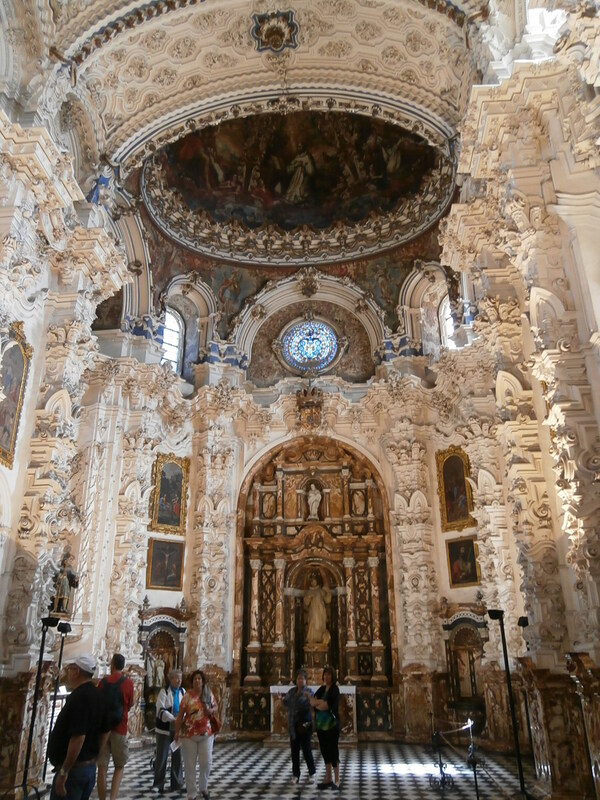 To the left of the main altar was the Holy Sanctuary or Sacristy. 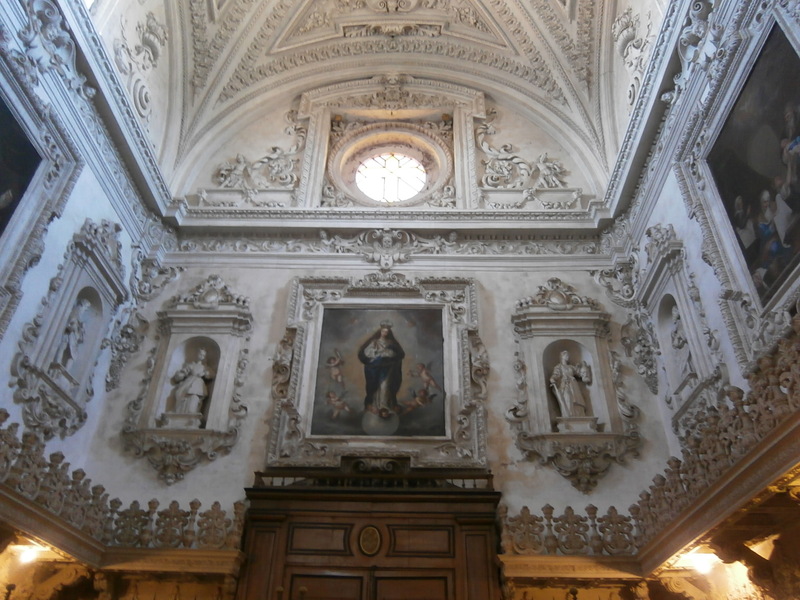 Construction of this chapel began in 1727 and took 37 years to complete. 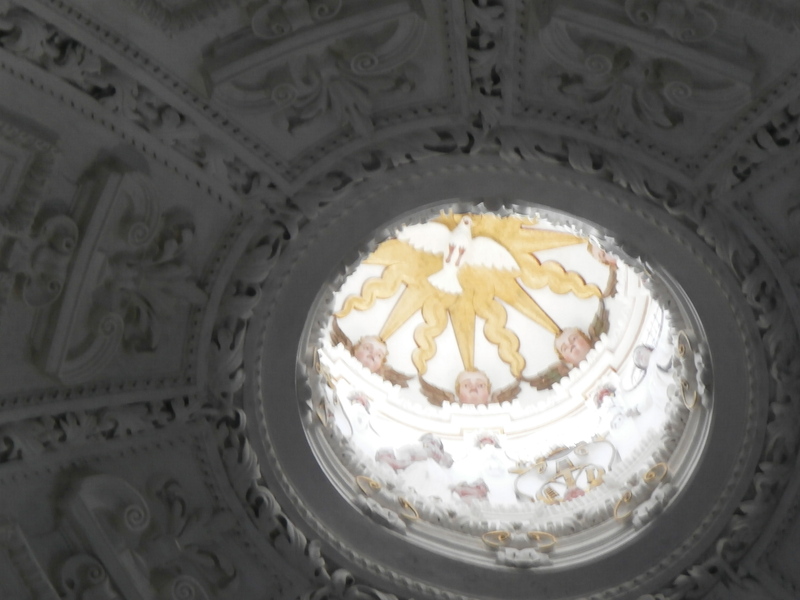 Every chapel had a dome. This one was completed in 1753 by Tomas Ferrer and depicts St. Bruno and St. John, among other leaders of the order. The Sanctuary hosts works of art by various artists and a gray marble altarpiece. This is the main altar of the Holy Shrine which is accessed behind a wall of glass behind the main altar of the Chapel proper. 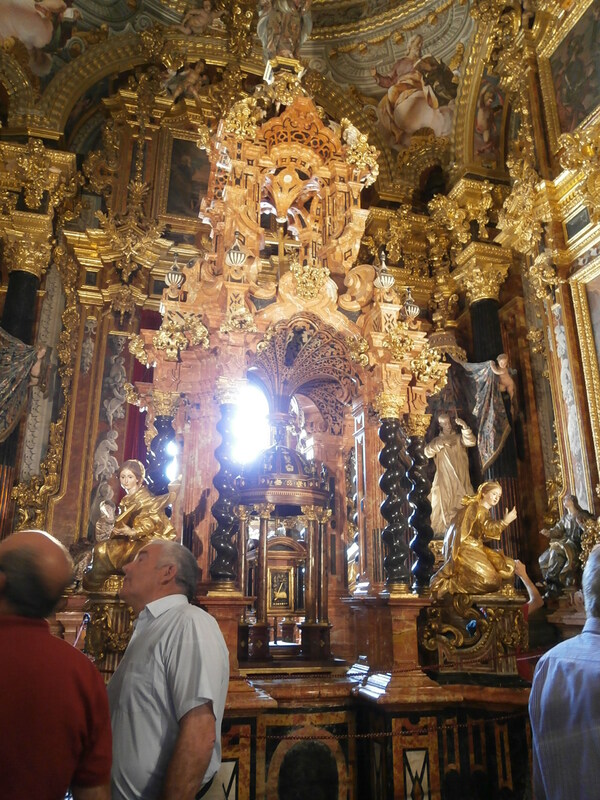 The altar was made of marble with guilt statues in each corner bearing the symbols of the Eucharist. The dome of the Holy Shrine. Painted by Palomino and completed in 1712 it depicts the hand of St. Bruno holding the Monstrance above the world. Also depicted is the Holy Trinity, with Our Lord at the right and St. John the Baptist to the left. As with the other two chapels this one was also covered in great works of art. 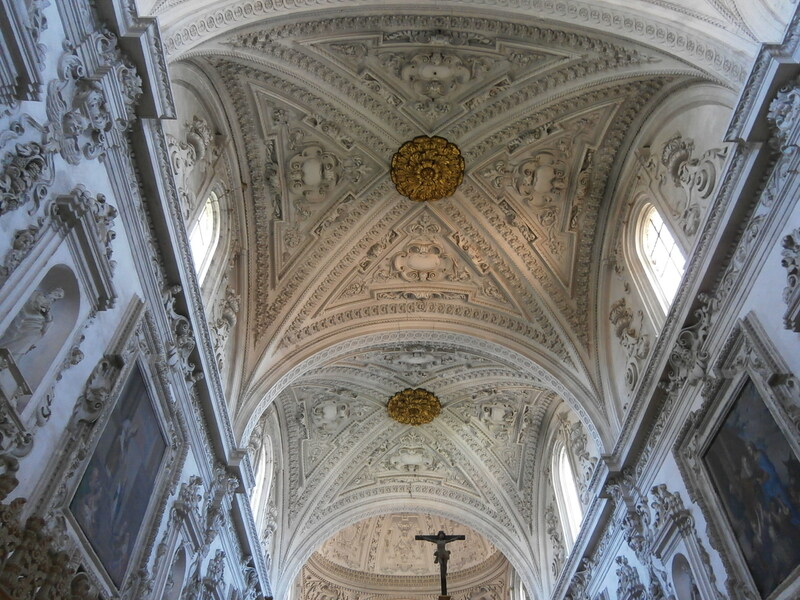 This special chapel was built between 1704 and 1720 by Francisco Izquierdo using different types of marble. 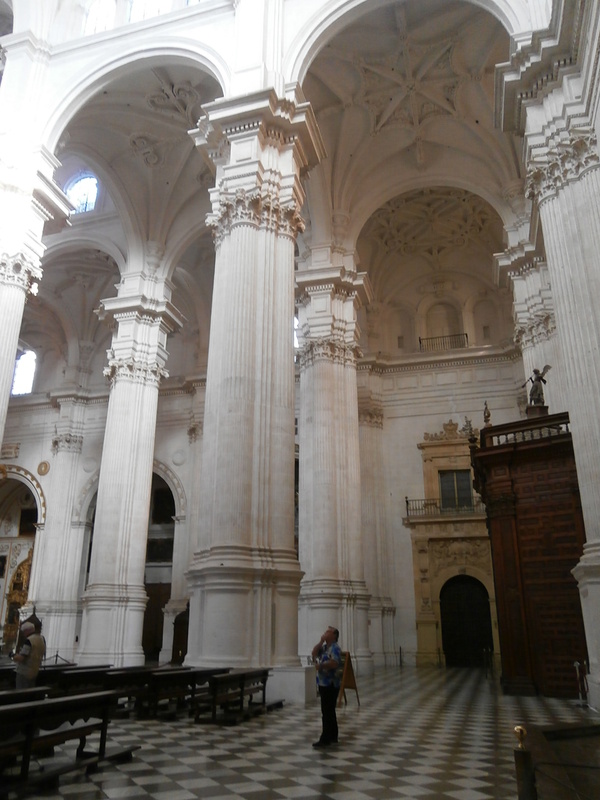 There are double Corinthian columns in each corner supporting the arches upon which the dome rests. 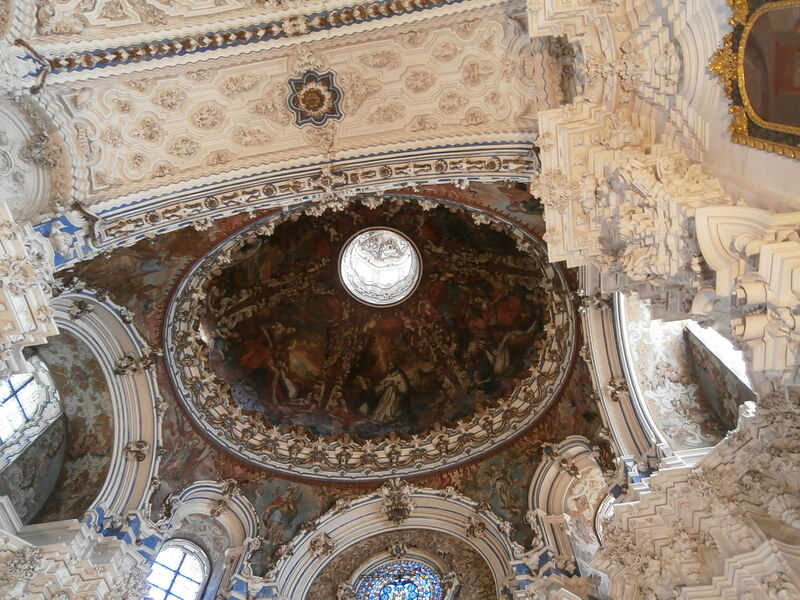 The final dome, over the main alter of the first chapel. It was quite a surprise to see the angels looking back at me. We couldn’t find anywhere where it was written but can’t you just hear some parent telling their children that if they needed proof that angels where watching over them they only had to look up. If we have learned anything over the last three years it is that we can still be awed by the beauty and surprises that seem to be all around us no matter where we go. 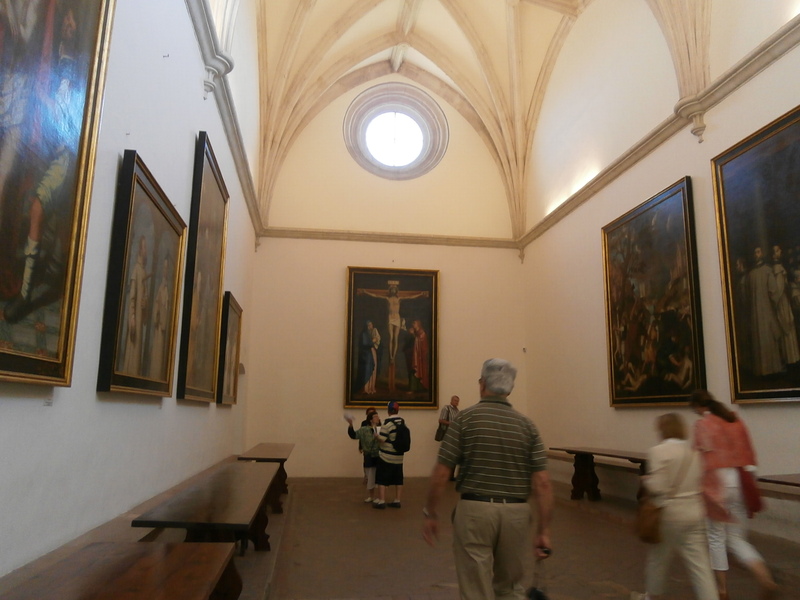 Such was our time at the Monastery of Cartuja. Feeling rejuvenated and inspired we left the monastery ready to explore more of what the city of Granada had to offer, and we walked with a youthful gait. We also began to wonder, where were all the pomegranates? When I met Mike I used to love watching TV shows or movies with him and when they showed a movie location or talked about a place I was usually able to say I’d been there. Mike wanted that ability so traveling was just something that was next on his bucket list. In the last three years he and I have traveled to four continents and over 20 countries. He now gets to watch movies and TV shows and I can see him smile when he recognizes a building or a city because he has been there. This adds a real different dimension to ones travel memories. What makes us both sad however is when those cities or countries we have lived in make the news for natural disasters or civil unrest. Recently there was a devastating earthquake that struck off the coast of Iquique, Chile. Iquique is at the top of my list of places to live in or return too someday. I loved our time on the beach front in this northern Chilean city. To hear of this massive earthquake that struck; to learn that six people lost their lives and that almost 900,000 people were trapped because the road into and out of the city was blocked by a rock slide, made us sad. We had a wonderful week in Iquique; not only is the city beautiful but the people we interacted with were warm and friendly. In fact our first emails were to those who we befriended in the city to make sure they were safe. We visited Sarajevo, Bosnia-Herzegovina last year and recently the US State Department sent out a travel advisory about visiting the city due to an action of civil unrest. Receiving these warnings makes us dig a little deeper into the issue and we read more about what is happening and when possible we connect with those we met in all of these places to make sure they are okay. We read about all of these issues because our view of them and their country has been changed by our experiences in that country; we think and feel perhaps more deeply for them and their plight and our empathy runs deeper. We also understand their quest for a better life and their need for a civil uprising. As we have been out here traveling from country to country we have also received warnings about civil unrest happening in Santiago, Chile; about the flooding in the UK, about violence in Panama, about volcanic activity on the island of Sicily, and so much more. These countries are no longer just places on a map to us. We know these are places with more than amazing historical monuments to look at, or countries with beautiful vistas to take photos of; these are places where warm and friendly people live; places where the locals struggle to live their every day lives; places where the people are perhaps either suffering or dealing with the aftermath of a disaster, and we feel sad. If everyone would travel to other regions of the world and met and greet and shake the hands of as many locals as possible and take the time to learn more about everyone’s culture maybe we would feel and react to issues they are dealing with differently. Our travel experiences over the last three years have therefore taught not us to be centric in our lives. We have learned that there are real issues of survival facing many people around the world. Therefore to all those we have met, whether it be a simple hello in the streets or in a lasting friendship that we have forged, to all those dealing with either a natural disaster or civil unrest we want you to know, we are thinking of you. I recently read a story about a Baby Boomer who went back to college to get his Ph.D. and he will graduate at the age of 68. Most people would read that story and simply say ‘good for him’. I read it and wondered if he will be signing up for any study abroad courses while a student. Study Abroad is a great way to learn more about a country and its culture and since you will have a student ID you will pay less to enter museums and other attractions. A study abroad curriculum is geared towards the country being traveled too. Be it art history classes offered for a trip to Florence, Italy, or culinary arts courses offered while living in Paris, France or even a poetry course offered for a stay in Oxford, England, the courses offered are as varied as the countries visited. Yes, you might be the oldest student in the room and while many might think this could be a problem I found it to be otherwise; that the students seemed to like having someone older in their midst who they could go to with questions or problems that they didn’t want the instructors to know about. Be prepared to do all the homework as assigned to you because even though you have paid all your fees, the instructor, or program leader does have the right to remove you from the course during the time out of the country and to send you home again if they deem your behavior to be inappropriate or a detriment to the other students. I worked at a rather large community college in California for many years and the Study Abroad department was located in my office so not only did I learn about the inner workings of the program but I learned about some of the great countries our students were exposed too. I’m a huge advocate of this type of travel and I encourage every retiree to sign up for college classes and to participate in a study abroad program. I was lucky enough, while working at the college to be able to sign up for a semester abroad. There I was, older than most of the instructors, attending courses, doing my homework and living, learning and exploring Greece for 30 glorious days. It is still an experience I talk about. There are lots of ways to travel for extended periods of time to other countries. Study Abroad programs offer you an opportunity to live in countries from 30 days to 3 months; countries as diverse as Italy, Bali, Greece, Australia, Thailand, India, and more. Retirement should be viewed as a time to do those things you want to do but just didn’t have the time to do before. For me that means going back to school and getting my degree. If it also means I’m qualified for Study Abroad courses and I can live in a foreign country for a semester all the better.